I created the Shop Directory to showcases the best online boutiques in one location, facilitating the shopping experience and helping you find great products you’ll love. Selected shops have that little something that makes me want to come back for more. They have been selected for their uniqueness, quality, style and product assortment. Hibou Home is one of them. It is a fab little shop with original products to create a stylish nursery, children’s bedroom or kid’s playroom, designed and made in England: Beautiful patterned wallpaper and fabric, gorgeous paper mâché animal heads, lovely cushions and bedding – All oh-so-cute. And they ship worldwide! So if you have little ones in your life, make sure to bookmark this fantastic store. Here are my top picks from Hibou Home. “At Hibou Home, we create children’s wallpapers and fabrics to suit today’s modern and stylish family home. Founded in 2011, with Liberty of London as our first stockist, we sell and ship worldwide through our online store and selected stockists. We believe you shouldn’t have to compromise when it comes to the style of your kid’s rooms, which is why we’ve created cool, designer wallpapers and fabrics that look fabulous and will stand the test of time. Our carefully chosen palette of Scandinavian inspired colours create a chic and sophisticated look that will suit stylish children’s spaces. 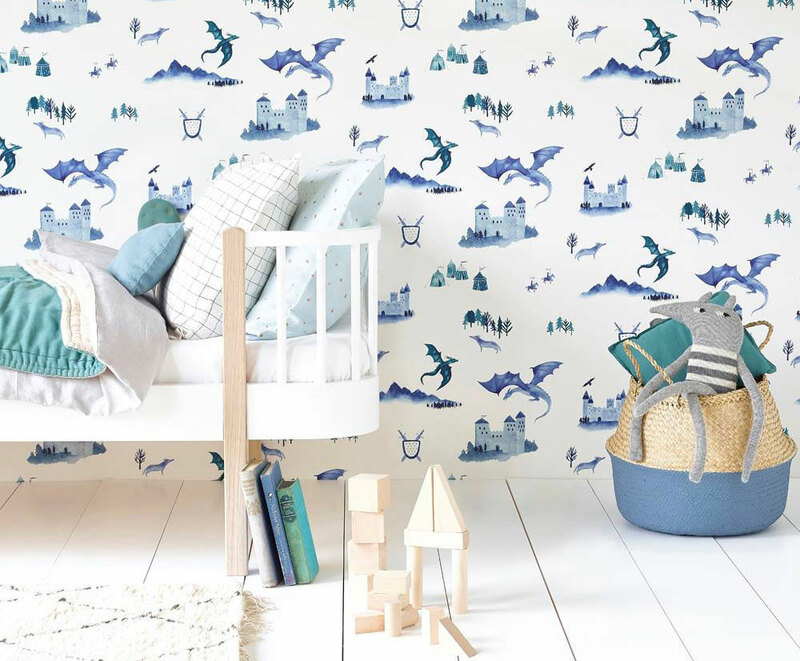 Perfect for little ones and older kids, our wallpapers and fabrics will harmonise beautifully with the rest of your home for many years to come. And to help you complete the look, we have added a selection of gorgeous bedding and accessories from some of our favourite brands. We care about quality and pride ourselves in creating superior wallpapers and fabrics that will last. Every roll of our wallpaper is meticulously produced with a wonderful depth and purity of colour in a chalky, matt surface finish that’s utterly striking. Furthermore, our wallpapers are printed on paper sustainably and ethically sourced from FSC and PEFC accredited suppliers. Note: This is NOT a sponsored post. Hibou Home is an online retailer that I truly love and genuinely recommend.